Once upon a time, the dolls of Racketty-Packetty House - Ridikilis, Meg, Peg, Kilmanskeg, and Peter Piper - lived in a beautiful dollhouse and had elegant names to suit their lovely clothes and handsome faces. But then Cynthia received Tidy Castle as a gift, and she hid Racketty-Packetty House out of sight behind her door and quite forgot about it. Despite being forgotten and neglected, however, the dolls of Racketty-Packetty House remain cheerful, enjoying observing the goings-on at the neighboring castle and making time every day to join hands and dance. Things become a bit complicated, however, when first, Peter Piper falls in love with a lady from Tidy Castle, and then it looks as though Racketty-Packetty House might be tossed out and burned. Just as the Toy Story films and Doll People books have done in recent years, this charming 1906 novella taps into kids' fascination with the notion that their toys might come to life when no one is watching. Burnett creates a believable situation in which many children find themselves - feeling tired of an old toy and ashamed by its drabness when a newer and more attractive model appears - and she uses it to demonstrate important truths about class differences, both in wealth and attitude. 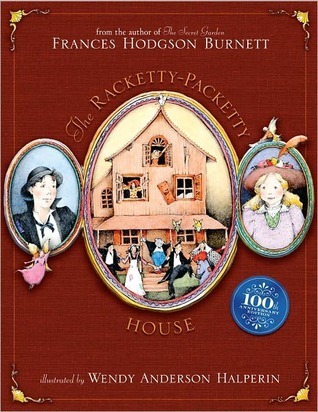 The residents of Racketty-Packetty house have many problems that could bog them down in sadness and self-pity, but they never indulge in either, whereas those who live at Tidy Castle have many material possessions but seem not to enjoy life. Using the dollhouses to represent two ways of life makes it easy for kids to discuss larger issues about wealth and poverty within a context that is familiar to them. I have never read The Secret Garden all the way through, so I couldn't say how The Racketty-Packetty House compares, but I did enjoy the writing style, descriptions, and overall moral of the story. I don't think my three-year-old is quite ready to hear this as a read-aloud just yet, but I wouldn't hesitate to share it with a six- or seven-year-old, especially if that child was a big doll lover, as I was at that age. Perhaps this is because my copy of the book is the 100th anniversary edition, but I also feel that the story is very accessible and contemporary-sounding, despite being published in the early 1900s. The updated illustrations by Wendy Anderson Halperin probably contribute to this a little bit, but even without them, I think the story still holds up really well. I look forward to reading this again with my girls in a few years!